Anyone have any good recommendations for a holster for my Glock 17. Not concealed carry, it has to be open carry here. Either a nice shoulder holster or hip carry. Got to be able to work with it. I have a Sport model in "natural" (color) for 1911 IDPA work. I quite like my Safariland. It's damn near ten years old and looks practically brand new. I use it with a 19 now, but I used to wear a 17 in it. It works for both. I don't recommend a shoulder holster. People think they look cool, but they're just not as practical or secure as a hip rig, in my opinion. Yeah as with most cross draw holsters, with a shoulder rig you're likely to "muzzle" some part of your body if/when you're pulling the pistol out of the holster if you're not extremely careful where the barrel is pointed. You definitely would need to hold your arm high on that side while drawing. Too much to think about, especially if adrenaline is flowing. I got my HCP 3 years ago.. While I don't carry much, I'd suggest a good belt too. My holster (the sig that came with the gun) wore spots in 2 decent dress belts. I bought 2 Crossbreeds and I threw all of my other belts away. Those on the Mitch Rosen site look good too. Might give one of those a try. I loudly like my Galco holsters. Check out Crossbreed Holsters. I have an IWB for a S&W Shield and love it. They make OWB holsters too. Raven Concealment System's Phantom OWB - the gold standard in OWB Kydex holsters. Here's my EDC from a couple of years ago - G19 with Phantom OWB, mag pouch and Wilderness Frequent Flyer belt. Beretta M92FS + 2 15-round mags in a Miami Classic + running = bruised ribs. If youre armed, you dont need to be running. Do you want leather or kydex? If you want a kydex holster I'd look at a bravo concealment holsters. For leather, go with something from Milt Sparks. I live in a rain forest - leather molds during the winter, rainy months so not leather. Mostly just want to have the gun handy if needed and it's not handy if its in your desk or safe so a holster seems like the best idea. Oh yeah, Tropics do that. Kydex is what I use for competition, but it can be hard on the gun's finish if it's something you care about (doesn't hurt my stainless Sig Sauer at all, but nice polished blued finishes can get beat up). 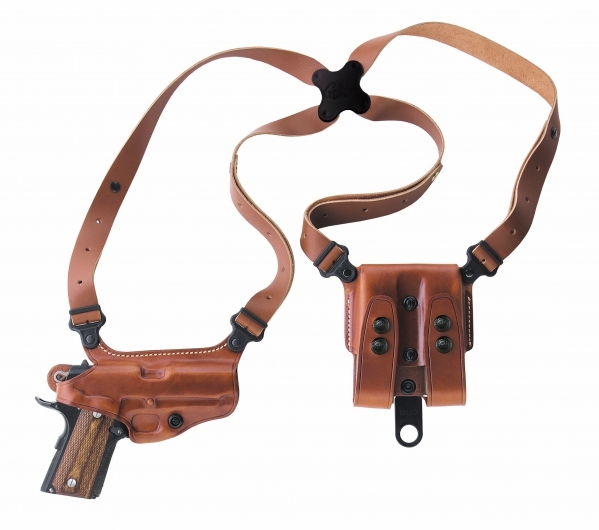 There are also nylon fabric holsters made by a variety of makers, usually pretty cheap. I think Uncle Mike's makes some. Blackhawk makes some of the fastest Level 2 and Level 3 holsters around and they're better today than a while ago for reliability and durability. Never was a fan of the Safariland top loop design.